The Speargrub (トゲデムシ?, lit. : "Thorned Bug") is an enemy found in Hey! Pikmin. It serves as an obstacle and cannot be killed. 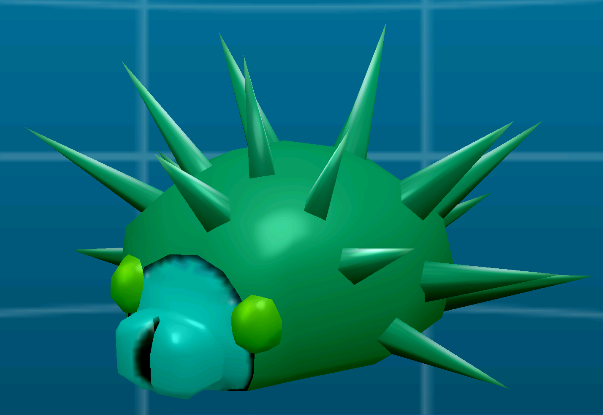 Speargrubs act as obstacles during puzzles that involve throwing Pikmin. They appear and out of holes in walls and move along set paths before disappearing and reappearing into other holes. They cannot be killed, and any Pikmin aside from Rock Pikmin will die if they touch them. Speargrubs are invincible and cannot be killed. Players must work carefully to avoid accidentally letting their Pikmin come into contact with them. Its back or underside in the Creature Log. Speargrubs in a room with Bouncy Mushrooms in Crystal Tunnels. More Speargrubs in another room in Crystal Tunnels. Speargrubs near the Snack Vault. This page was last edited on February 13, 2019, at 18:13.